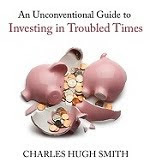 oftwominds-Charles Hugh Smith: Where Will All the Money Go When All Three Market Bubbles Pop? Where Will All the Money Go When All Three Market Bubbles Pop? With the Fed funds rate pinned to near-zero, bonds are in a bubble as well. Thank you, Michael J.R. ($100), for your outrageously generous contribution to this site-- I am greatly honored by your longstanding support and readership.